Figure 9.9. GTP and its nonhydralyzable and slowly hydrolyzable analogs used for studying the functions of the translation factors and the ribosome. GTP, guanosine 5'-triphosphate; GMP-PCP, nonhydrolyzable analog 5'-guanylyl methylene diphosphonate; GMP-PNP, very slowly hydrolyzable analog 5'-guanylyl imidodiphosphate; GTP(gS), slowly hydrolyzable analog guanosine 5'-(g-thio) triphosphate. either identical or at least strongly overlapping. In any case, these proteins compete against each other for the binding site on the ribosome and cannot be present on it simultaneously. Since all of the proteins mentioned are easily released from the ribosome after GTP hydrolysis, the study of their binding in vitro may be most conveniently performed if the GTP is replaced by a non-hydrolyzable analog, e.g. guanylyl methylene diphosphonate (GMP-PCP) or guanylyl imidodiphosphate (GMP-PNP) (Fig. 9.9). The complex of the protein with such an analog interacts with the ribosome and is retained on it. The study of the binding of protein EF-G to bacterial 70S ribosomes has perhaps been the most thorough. EF-G with GMP-PCP may form a complex with both the translating and the vacant ribosome. EF-G with GTP also interacts with the translating ribosome and the vacant ribosome but it is not retained there because GTP undergoes hydrolysis and EF-G and GDP are released from the particle. In the presence of antibiotic fusidic acid (see Fig. 12.4), however, EF-G preserves its affinity to the ribosome even after GTP has been cleaved. The isolated 50S ribosomal subunit behaves in a manner similar to the complete ribosome: EF-G with GMP-PCP, as well as EF-G with GTP (or, to be more accurate, with the product of GTP cleavage) in the presence of fusidic acid, forms a rather stable complex with the subunit; the interaction of EF-G plus GTP with the 50S ribosomal subunits results in GTP cleavage and the release of EF-G and GDP. No appreciable interaction of EF-G with the isolated 30S ribosomal subunit has been detected. Thus, it may be concluded that the site responsible for EF-G binding is formed mainly by the 50S ribosomal subunit. MH4Cl/ethanol mixture, resulted in a markedly decreased binding of EF-G to the ribosome (Hamel et al., 1972). More recent experiments with using the hot tritium bombardment technique (see Section 8.2.4) have demonstrated that the EF-G bound to the 50S subunit shields only the protein L7/L12 and the adjacent L11 (but not L10) from the tritium atoms flow. Hence, the L7/L12 stalk and its base seem to be the site of EF-G binding. The foot-printing technique (Noller et al., 1990) has demonstrated that the interaction of the bacterial ribosome with either EF-G or EF-Tu results in protection of the so-called sarcin/ricin loop of domain VI in the 23S RNA. This is the end loop of the first hairpin (positions 2646-2774 in Fig. 6.5 B) of domain VI known to be the target of two specific enzymes inactivating the bacterial ribosome, sarcin cleaving the internucleotide bond between G2661 and A2662, and ricin that produces depurinization of A2660 (see Sections 13.5.3 and 13.5.4). This hairpin comprises one of the most highly conserved nucleotide sequences of rRNAs. Until recently, it was thought that the sarcin/ricin loop at positions 26532667 has a single-stranded conformation. However, NMR studies have shown that its structure is well ordered and only two nucleotide residues, A2660 and G2661, are not involved in secondary structure interactions. Both EF-G and EF-Tu have been shown to protect G2655, A2660 and G2661 (Fig. 9.10 A). It seems that the sarcin/ricin loop is the main common site of the interaction of the elongation factors with 23S RNA in the 50S ribosomal subunit. Figure 9.10. Binding sites of elongation factors Tu and G on the E. coli 23S rRNA. A: Secondary structure of the sarcin/ricin region, based on NMR data obtained for the corresponding sequence from eukaryotic 28S rRNA (A. A. Szewczak & P. B. Moore, J. Mol. Biol. 247: 81-98, 1995). The ricin-catalyzed depurination site (Y. Endo, K. Mitsui, M. Motizuki & K. Tsurugi, J. Biol.Chem. 267: 5908-5912, 1987) and the sarcin cleavage site (I. G. Wool, Trends Biochem. Sci. 9: 14-17, 1984) are indicated by arrows. The sites protected by EF-G and EF-Tu (D. Moazed, J. M. Robertson, & H. F. Noller, Nature 334: 362-364, 1988) are encircled. B: Secondary structure of the GTPase region of the 23S rRNA. The major (A1067) and minor (1095) sites protected by EF-G (D. Moazed, J. M. Robertson, & H. F. Noller, Nature 334: 362-364, 1988) are encircled. 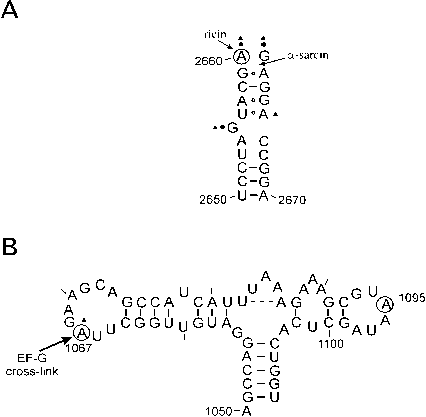 In addition, EF-G protects A1067 in the end loop of a compound hairpin of domain II of the 23S RNA (see Fig. 6.5 A). Also EF-G can be cross-linked with this loop. This part of the 23S RNA structure (the three-way helical structure at positions 1030-1125) is known to accomodate the protein complex L10:(L7/L12)4 and protein L11, as well as to be the site of the interaction of antibiotics thiostrepton and micrococcin with the 23S rRNA. These antibiotics (in the presence of protein L11) when bound to the ribosome inhibit the EF-G-dependent GTP hydrolysis. 2'-O-methylation of A1067 confers to the ribosome the resistance against the drugs. The structural element under consideration (Fig. 9.10 B) is sometimes called "GTPase region". Thus it is likely that EF-G, and probably other GTP-dependent translation factors, interact with two areas on the large subunit: one is the L7/L12 stalk, including both its protein and rRNA moieties, and the other is the sarcin/ricin loop seemingly located somewhere near to the base of the stalk. This conclusion is confirmed by studies of the site of thiostrepton binding (see Cundliffe, 1990). Thiostreption (see Fig. 10.11) is an antibiotic preventing the binding of EF-G and EF-Tu to 50S ribosomal subunits. It has been shown that the antibiotics binds to the subunit in the region of protein L11 and the L11-protected 23S RNA sequence 1050-1110. This is the same region where EF-G can be cross-linked and where it protects the nucleotide residue against chemical attack (Fig. 9.10, B). The region is in the viccinity of the proteins L7/L12. Thus the effect of thiostrepton can be explained in such a way that this rather large molecule bound at the base of the L7/L12 stalk directly blocks one of two principal sites of interaction of the ribosome with elongation factors. Figure 9.11. Localization of the elongation factor-binding site on the large ribosomal subunit by immuno-electron microscopy. 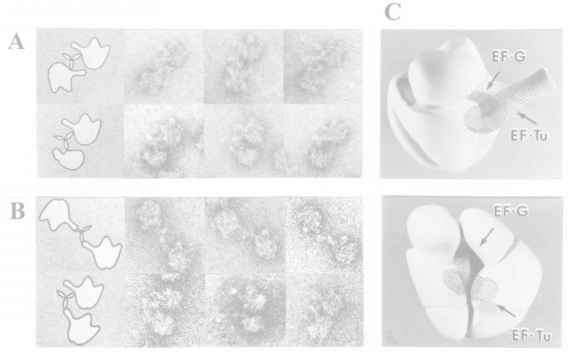 A: Electron micrographs of 50S ribosomal subunits with EF-G reacted with antibodies. (A.S. Girshovich, T.V. Kurtskhalia, Y.A. Ovchinnikov & V.D. Vasiliev, FEBSLett. 130: 54-59, 1981). 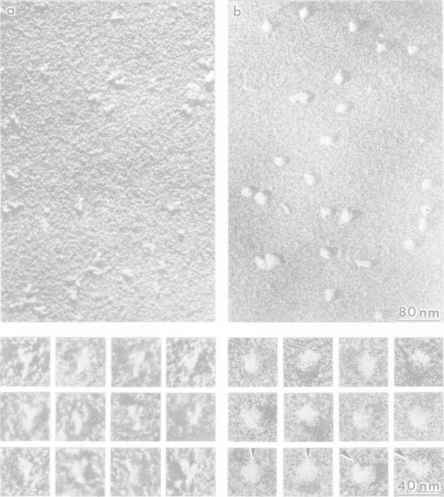 B: Electron micrographs of the 50S subunits with EF-Tu reacted with antibodies. (A.S. Girshovich, E.S. Bochkareva & V.D. Vasiliev, FEBS Lett. 197: 192-198, 1986). C: The model of the 70S ribosome with the approximate localization of EF-G and EF-Tu at the base of L7/L12 stalk (hatched areas). (Original photos are kindly provided by V. D. Vasiliev). crosslink between EF-G and its attachment site was obtained by irradiation. Subunits with such a covalently linked protein (EF-G) were treated by antibodies against EF-G, and the complexes studied by electron microscopy. Fig. 9.11 A, shows the location of the site of antibody attachment at the base of the L7/L12 stalk, on the interface side of the 50S ribosomal subunit. It should be pointed out that although the 50S ribosomal subunit is largely responsible for the recognition and binding of EF-G, the EF-G may also come into contact with the 30S subunit. Specifically, protein S12 can be crosslinked by a disulfide bond with the EF-G if the complex between the EF-G and 70S ribosomes is subjected to oxidation (Girshovitch et al., 1981). This result indicates that the ribosome-bound EF-G protrudes from the large subunit to the protein cluster S4-S5-S12 of the small subunit. More recent observations on the interaction of the tRNA-like domain IV of EF-G (see Sections 12.2.1 and 12.2.3) with the decoding center of the 30S subunit and specifically with position 1400 of the 16S rRNA (Wilson & Noller, 1998) confirm this view. The other elongation factor, EF1A (EF-Tu), is delivered to the ribosome as a complex with the aminoacyl-tRNA and GTP. EF1A interacts with the ribosome when the complex is bound. In experiments with bacterial ribosomes it has been shown that it binds to the 50S ribosomal subunit. The presence of EF-G on the 50S subunit prevents EF-Tu from interacting with the ribosome, which leads to the conclusion that the EF-Tu-binding site either coincides with or overlaps the EF-G-binding site. As in the case of EF-G, the antibodies directed against protein L7/L12, and only these antibodies, inhibit the interaction between EF-Tu and the ribosome. The removal of protein L7/L12 strongly reduces the interaction between EF-Tu and the ribosome. Immuno-electron microscopy studies have demonstrated that antibodies against EF-Tu can be detected both at the base and at the tip of the L7/L12 stalk (Fig. 9.11 B). The initiation factor IF2, and the termination factor RF3, also compete with EF1 and with EF2 for the binding site. Their interaction with the ribosome again depends on the presence of protein L7/L12. All of this information supports the assumption that the binding of all translation factors, using GTP as an effector, has many common features and that the ribosomes possesses a single factor-binding site at the L7/L12 stalk on the 50S ribosomal subunit. In all cases GTP must be bound to a translation factor, such as EF1, EF2, IF2, RF3, prior to factor binding to the ribosome. Therefore, it is apparent that the GTP-binding center is located on the factor protein itself. However, hydrolysis of the bound GTP into GDP and orthophosphate takes place after the factor is bound to the ribosome. In other words, both the factor and the ribosome in a complex are required to induce the GTPase activity. It is the attachment of the GTP-containing factor to the ribosome that results in the GTP hydrolysis. At the same time, a number of experiments with photoactivable GTP analogs have demonstrated that if a chemical crosslink between GTP and surrounding groups is induced after the EF-G:GTP ribosome complex has been formed, then EF-G, but not the ribosomal components, is attacked preferentially, regardless of which moiety of GTP carries the photoactivable group. Moreover, the antibiotic kirromycin (see Section 10.3) has been shown to induce an intrinsic GTPase activity of EF-Tu, in the absence of ribosomes (Chinali et < 1977). 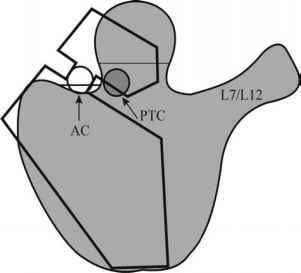 It Figure 9.12. Mutual orientation of two ribosome-bound is therefore now generally held that the tRNA molecules represented as ribbon-drawn models: the attachment of the factor to the ribosome results anticodons are immediate neighbours on the mRNA chain, in an activation of the intrinsic GTPase center the acceptor ends are also brought together, while the corners of the factor, while the ribosome does not ("elbows") are arranged apart. possess either a preexisting GTPase center or any indispensable complement of the GTPase center of the factor. The ribosome possesses an intrinsic affinity to tRNA. 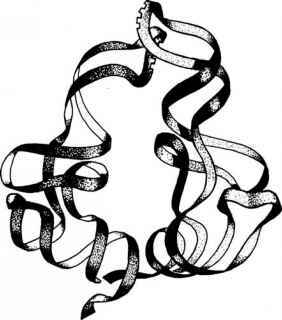 A vacant ribosome can bind any tRNA or its derivative, e.g. aminoacyl-tRNA or peptidyl-tRNA, in the absence of a template polynucleotide. The presence of a template polynucleotide makes this binding specific: only the tRNA corresponding to the template codon, i.e., the cognate tRNA, will be bound. It is likely that a codon exerts both positive (cognate codon) and negative (non-cognate codon) discrimination effect on the binding of tRNA to the ribosome. Since two substrates, aminiacyl-tRNA and peptidyl-tRNA, participate in the central chemical reaction of the elongation cycle, the main question is where the corresponding A and P sites are located on the ribosome. The following obvious postulates must be put at the basis of any considerations concerning the tRNA positions in the translating ribosome: (1) The anticodons of the two tRNAs, one in the A site and the other in the P site, must be drawn together, in order to provide their interactions with neighbour codons along mRNA. (2) The acceptor ends of the two tRNAs also must be in close proximity, in order to provide the transpeptidation reaction. (3) The central cores ("elbows") of the two L-shaped tRNAs may be drawn apart. Thus, the two tRNAs form a tRNA pair (Fig. 9.12) that can be considered as a unit in the search of its position on the ribosome.